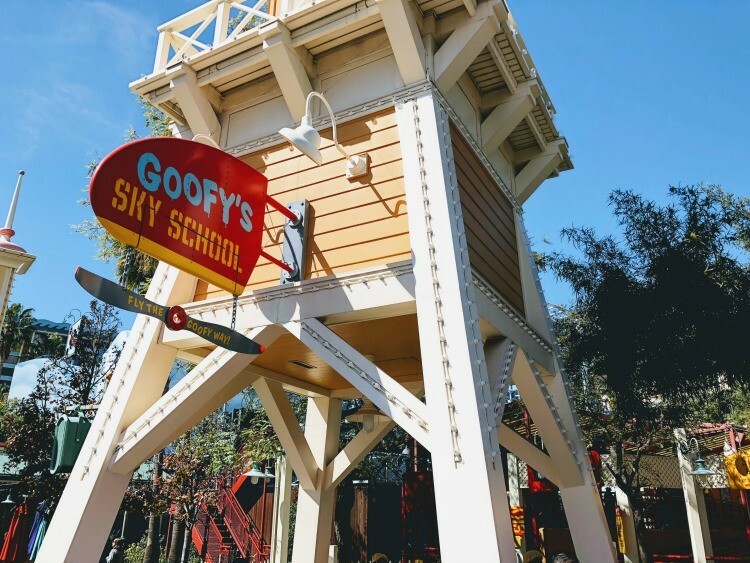 With so much to see and do at the Disneyland Resort in Anaheim, California, you need to do some advance research on where to spend your time. Many are familiar with the classic rides and attractions at Disneyland Park, but do you know all there is to do across the way at that “other park”? Disney California Adventure is growing fast and offers some fun excitement for kids of all ages. Here’s your essential ride guide for Disney California Adventure Park at the Disneyland Resort. 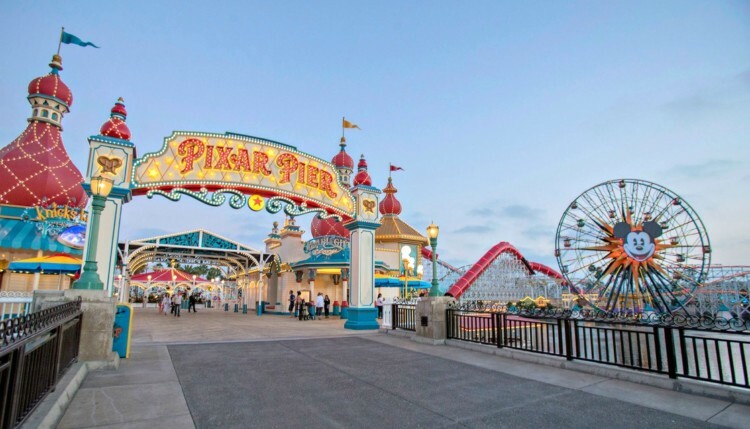 What’s the Best Ride in Disney California Adventure? I’ve visited Disneyland as a kid, but our first family visit to the resort included a whole new park, Disney California Adventure Park. This park was originally created as an ode to the state of California and even included some nostalgic nods to the California Walt Disney would have known. 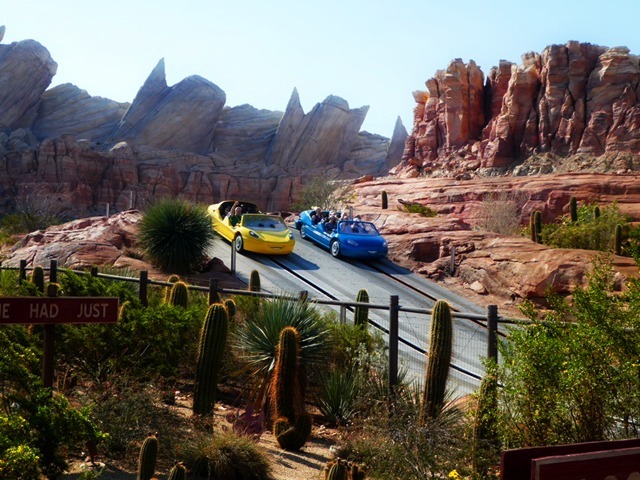 Over time, this park has continued to grow and add new lands and attractions, including the popular Cars Land. Not sure where to start? This California Adventure rides list will help you plan for your next Disneyland vacation! Traveling Mom Tip: be sure to measure your kids before your trip so you know what rides they’re eligible to ride. I’ve included the California Adventure ride heights in the guide below. The Grizzly Peak “land” at Disney California Adventure is one of the closest to the entrance and breaks off to the right once you walk down Buena Vista Street. This area also is where the private Disney Grand Californian Hotel entrance is located in the park. Guests must be 40″ or taller to ride. In my opinion, this is one of the best rides at California Adventure. This attraction simulates flying in a hang glider over breathtaking landscapes, previously filmed at diverse locations across the gorgeous state of California. Disney slated it to be updated, to now feature iconic destinations from across the world in the all-new Soarin’ Around the World. I was impressed by the choice of international landmarks included, like the Eiffle Tower, Great Pyramids of Eygpt, and even Mount Kilimanjaro. Like the previous attraction, there are some exciting film surprises on-screen and in the air during the journey. Repeated rides can help you take in more of each scene. I recently discovered that you can see manta rays in the water as you first glide over Fuji! 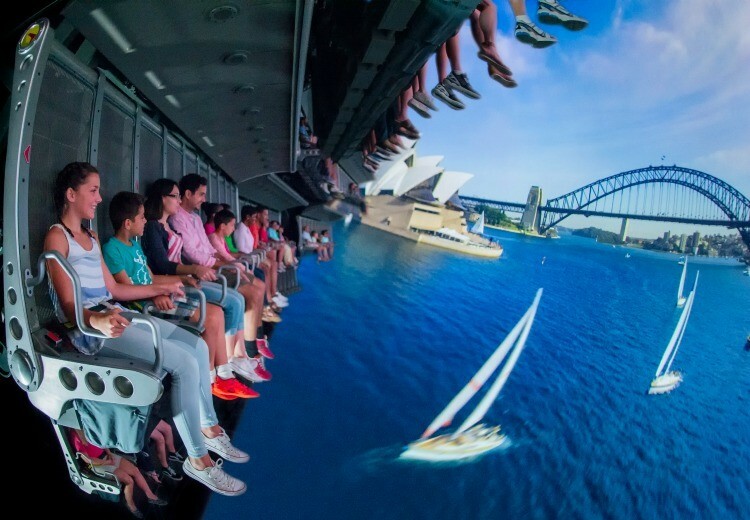 Soarin’ around the World will surely leave you with an appetite for global travel. Guests must be 42″ or taller to ride. Here’s the California Adventure water ride for those hot summer days. If you’ve been to Animal Kingdom at Walt Disney World, you’ll recognize this as a similar ride to Kali River Rapids. 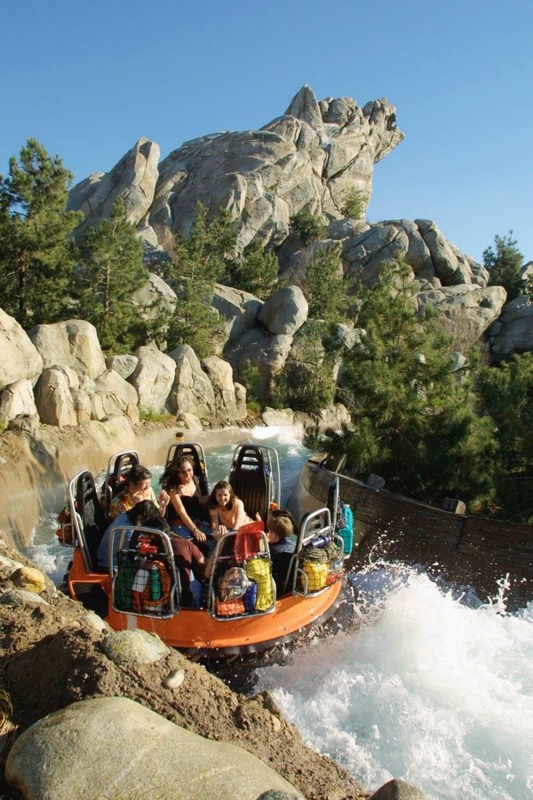 Guest sit in 8-passenger rafts and float around a themed California river environment, complete with drops and lots of splashes. This is a favorite of my girls on hot days! Be sure to pack away your valuables and be ready to get wet. There are lockers available near the ride that are free for 2 hours. Guests can be any height; however, Sequoia Smokejumpers Training Tower (tire swing zipline) has a height requirement of a 42 inches (106 cm) minimum and 63 inches (160 cm) maximum. Guests must be under 13 years old to ride. Cliff Hanger Traverse Rock Climb has a height requirement of a 42 inches (106 cm). While this isn’t a ride, it is an attraction that my girls loved when they were younger. It’s one of our favorite memories from when our girls were preschoolers at Disneyland. Kids can get a wilderness explorer’s map when they arrive and follow the trail around on a nature scavenger hunt. There are fun bridges, a rock wall, and even a tire swing that kids will use to explore the trail. Paradise Pier is probably one of the most photographed areas of Disney California Adventure. It features the signature Mickey’s Ferris wheel and is the site of the World of Color night show. This area of the park was just transformed from Paradise Pier to Pixar Pier. Guests will find themselves immersed in four whimsical neighborhoods inspired by beloved Pixar stories—including “The Incredibles,” “Inside Out” and “Toy Story.” The fourth neighborhood is a celebration of many of your favorite Pixar stories, featuring the Pixar Pal-A-Round. There’s also currently Pixar Fest happening in the park! Guests must be 48″ or taller to ride. The Incredicoaster is what was known as California Screamin’. It’s probably one of the biggest thrill rides in the whole Disneyland Resort. This newly re-imagined attraction boasts enclosed Incredibles-red tubes that tower over Pixar Pier and a mid-century-modern-inspired loading area where vehicles wait to whisk Guests off on the Incredicoaster! Plus, all-new special effects, character moments, scenes and a musical score by Incredibles 2 composer Michael Giacchino adds to the super-fied fun! Guests any height to ride. This fun 4D ride shuffles you around to different screens and gives you the chance to test your aim. Points pile up when you hit your mark. As any good cowboy or cowgirl knows, harder-to-hit targets are worth more. After each game, your score is posted showing how well you did; after all games are played, your total score is tallied and displayed. Play in 5 fun Toy Story themed games and compete against the other people in your same vehicle. Only one can become champion of your ride vehicle! Guests can be any height to ride. This is a reimagined version of Mickey’s Fun Wheel features all of your favorite Pixar Pals on the sides of this fun ferris wheel. The 24 carriages will feature different pairs of Pixar pals, including Joy and Sadness from “Inside Out,” Lightning McQueen and Mater from “Cars,” and Miguel and Hector from “Coco.” There are 8 stationary gondolas, and 16 swinging gondolas. The swinging gondolas glide on interior rails and sway during the trip, creating a sometimes dizzying—but always exhilarating—effect. All gondolas carry up to 8 people. This is currently King Triton’s Carousel but will soon be reimagined to fit the new Pixar Pier theming with a nod to Jessie’s wilderness friends in the “Woody’s Roundup” television show from “Toy Story 2. This ride makes me think of all the “dark rides” at Fantasyland in Disneyland. It’s also very similar to Haunted Mansion, but of course happy and kid-friendly. Guests load into their seashell and sail off into the story of Ariel’s adventure. Along the way you’ll see your favorite Little Mermaid characters, and I dare you not to sing along to some of your favorite Little Mermaid songs. This is a spinning rocket ship ride and is surprisingly smooth. You’ll feel like you’re gliding thru the sky and flying over Paradise Pier. This is a fun ride to go on at night, but do note that it closes early for World of Color. Two-person jellyfishes float up the 40-foot tall kelp stalk to give the riders a great view. You then float down and up as you float along with the currents aboard your jellyfish. These lines can get long and it’s a short 90-second ride. In my honest opinion you shouldn’t wait unless it’s a short wait time. Guests must be 42″ or taller to ride. Children under age 7 years must be accompanied by a person age 14 years or older. Climb aboard your flight-training vehicle and hang on as you travel 3 stories in the air. Journey across 1,200 feet of track on a zany roller coaster ride up, down, around, over and through the clouds. This ride is short but there’s one good downhill that is surprisingly fun. We also love the funny billboards located along the track. Beware for a very abrupt stop at the end of the ride. Guests must be 48 in to ride alone. Anyone between 40 and 48 inches must ride in a double swing with a responsible person. Be swept off your feet and soar gracefully through the air, as the central canopy gently rocks you back and forth. This classic swing ride provides the careless thrills of flying as it twirls you around, providing unbelievable views of the shimmering water and exciting attractions of Paradise Pier. 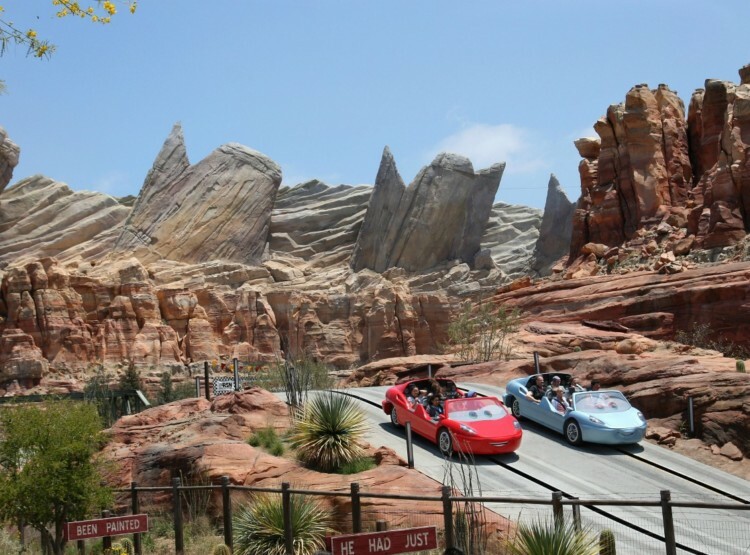 Cars Land is the newest land added to Disney California Adventure Park. It will immerse you into the Route 66 of Cars. The theming of the land is amazing and you’ll find 3 rides in this land, including what I think is one of the best rides at California Adventure. I knew this Cars Land headliner would be a highlight, but I still managed to somehow underestimate it. Without a spoiler, I will just say they’ve incorporated similar ride technology as is used by Test Track, in Florida’s Epcot. Our family has fallen in love with this ride and it’s always one we have to do more than one time! The trick used to be to do the single rider line; however, if you’re going later in the day, the single rider line can get long. We like to do this at park opening or save it for the last ride of the day and hurry into line a minute or two before park closing. Traveling Mom Tip: Did you know that you can enter ride lines up to the park closing time? Park closing time is when the ride lines close, but the rides operate until every guest has ridden. A great perk for families with older kids or night owls! Guests must be 32″ or taller to ride. This ride uses a unique air floor to float the cars around (imagine an air hockey table). It’s almost as fun to watch as it is to ride. Adorable little roadsters float smoothly across the ground, as they perform a synchronized dance to festive, Italian-inspired music. The roadsters start their synchronized “moves”—which are unique to each car’s character—once the music begins. Songs sung by Luigi and members of his Carsoli crew include Rollicking Night and Day, Mambo Italiano and The Tire-antella. As you’re carried across the “dance floor,” notice Luigi’s beautiful Italian garden, which features cypress and olive trees, a tile mosaic, tire-inspired details and even an “autopiary” of his legendary hero, Formula Racer Francesco Bernoulli from Cars 2. This ride is a bit like the teacup ride, so motion-sensitive individuals beware. Get into a cute tractor and trailer and get ready to spin. Hold on tight as they whip and whirl in “figure eight” movements around the scrapheap dancefloor. Weave in and out in a circular fashion, while rug-cuttin’ tunes sung by Mater keep the hoedown swingin’ and swayin’ all day long. 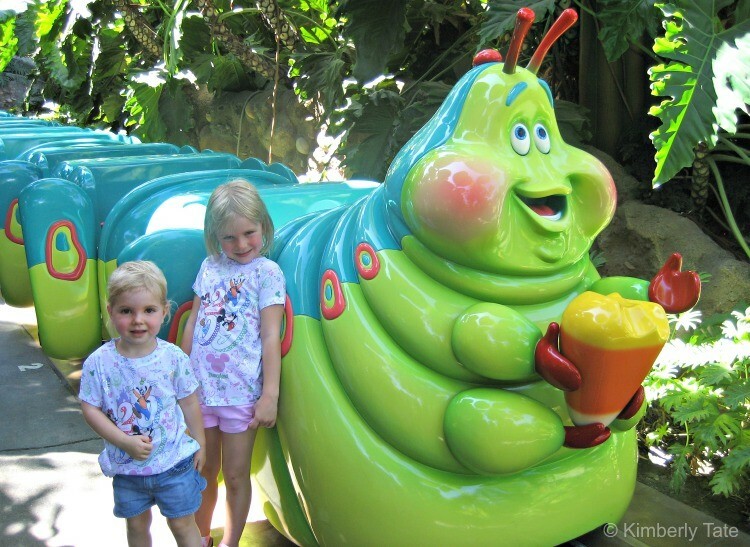 A bug’s land was one of our favorite lands when the girls were little. It’s themed to make you feel like you’re bug-sized with extra large plants and food boxes all around. Also, take note of the popsicle stick benches. We spent many turns riding around on Heimlich as he ate his way through some yummy goodies including watermelon and even animal crackers! Guests must be 36″ or taller to ride. Hop inside a pill bug and maneuver your way under the big top, carefully avoiding—or bumping—the other buggies around you. As you scurry counter-clockwise beneath the tent, listen to loveable Tuck and Roll chatter away about your acrobatic abilities. What in the world are they saying? Maybe you can be the first to figure it out! Another teacup-like ride, you must like spinning to give this one a go! Climb on everybody’s favorite feisty ladybug and get ready to cut a rug! As boppin’ music begins to play, quickly whirl under a colorful canopy past a giant, old-fashioned 45 rpm record. Your ladybug doesn’t just spin to the music; it grooves on a figure 8 track! Laugh all the way to the last note of the ladybug’s hip single on this attraction that promises a jumpin’ good time for one and all! Guests can be any height for admission. This isn’t a ride, but deserves to be added to the list. This is a fun 3D movie inspired by the movie, A Bug’s Life. There are some 4D surprises, too. I have heard that some really young bugs or sensitive bugs can be overwhelmed and scared in this movie. Hollywood Land has a few hidden gems, as well as what’s consider by some Disney enthusiasts to be one of the best current rides in all Disney parks. This land is themed to feel like you’re walking around Hollywood and features special movie themed attractions. This ride is a makeover from the classic Tower of Terror attraction. This is a must-do for any Guardians of the Galaxy fan, and really a must-do for anyone who likes thrill rides. I’ve ridden it once but unfortunately, it left me with an upset tummy. Make sure you won’t be bothered by continuous up and down drops and lifts. After commandeering a gantry lift, you’ll join Rocket—recently escaped from his case—on a harrowing mission to rescue his fellow Guardians… but not before unleashing intergalactic mayhem in the process, from the top of the fortress to the bottom, and all to the tune of one of Star-Lord’s awesome mixtape songs! Venture inside the Monstropolis Transit Terminal and climb into a yellow-and-black taxi cab for a monster city tour. As your journey begins, an emergency “special report” is unexpectedly broadcast inside your cab: A child is loose in Monstropolis and must be apprehended! Motoring through many of the settings and scenes made famous in the Disney•Pixar film Monsters, Inc., this fun-filled attraction invites you to embark on an exciting adventure with friendly monsters Mike and Sulley as they race to return little girl Boo safely to her home. But don’t get caught: C.D.A. Agents and creepy chameleon Randall Boggs want Boo too and are in hot pursuit. Can she find the way back before it’s too late? With four convenient stops, and cars running approximately 8 minutes, take a scenic ride on a vintage street car. Board or disembark at any of the following locations: Buena Vista Street near the Disney California Adventure Park Main Entrance, Carthay Circle across from Carthay Circle Restaurant, Hollywood Boulevard near the Disney Animation building, Sunset Boulevard past the Hyperion Theater. This new Broadway-caliber production of Frozen performed at Disney California Adventure’s Hyperion Theatre will definitely take up some of your time. It’s a popular show, requiring lining up 45 minutes or so before for great seats, and at least 10-15 minutes before to gain admission. Then the musical production itself lasts just under one hour. For this reason, and because we were only visiting for one day, we debated whether to go. I’m so glad we did. I can say with certainty that it is worth the time! Frozen is a quick moving, visually stunning, highly enjoyable show. The costumes are vibrant, stage sets cleverly done, and technology effects thrilling to watch (think Elsa making ice and snow from her fingertips!). 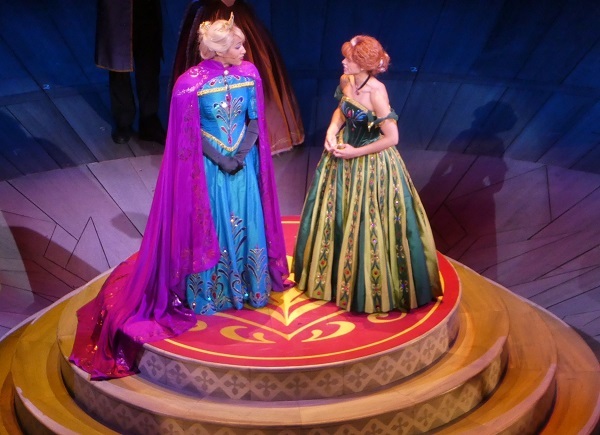 I wrote a review with additional photos at Is Disney California Adventure’s “Frozen – Live at the Hyperion” Worth the Time? 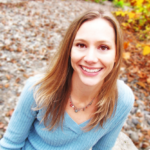 And TravelingMom Amy has some excellent tips to check out before heading to this show. In spite of numerous trips to Walt Disney World Resort, we had never visited the Animation Academy at Hollywood Studios. Our Cast Member guide insisted that “ours is much better,” as he led us into the soothing, air-conditioned lobby of the Animation Building. Once inside, I was shocked at how large it was. Dark and cool, there were multiple movie screens playing Disney movie clips all around the upper perimeter of the central lobby. With numerous benches to rest and take in the entertainment, pick this comfortable and fun spot as a fantastic place to duck in and take a break from the heat. It also serves as the entrance to three separate attractions. Our favorite: Animation Academy. When your show time begins, you are lead into a stadium seating theater. 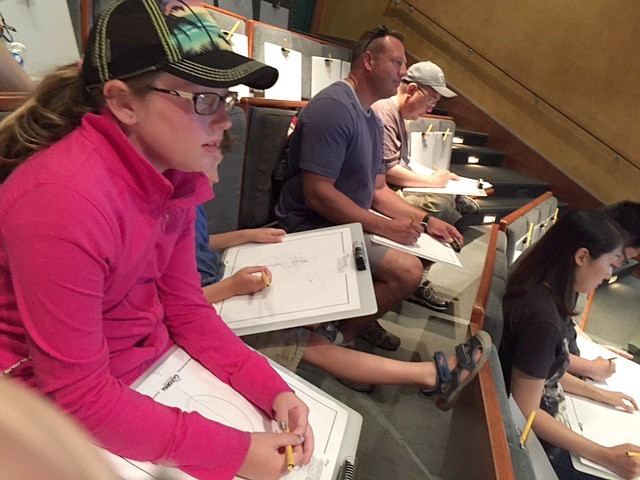 Each guest receives a clipboard, animation paper, and pencil. 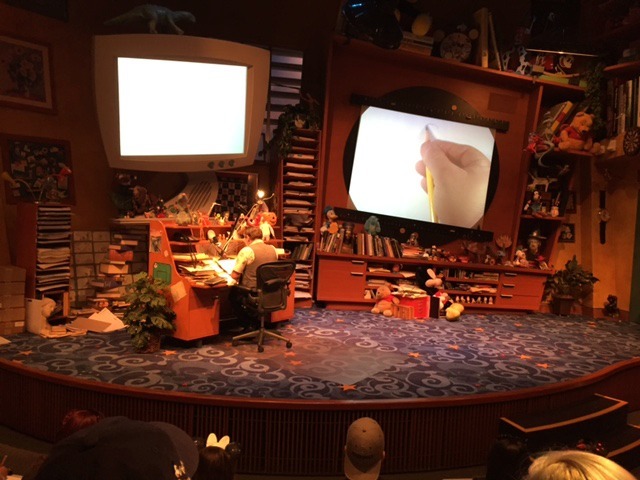 Your animation host will then lead you through step-by-step instructions on how to draw the featured Disney character. Everyone loved this, from the adults in our group to my 5-year-old. You’ll get a real kick out of how well your character drawing turns out! Don’t miss this. You’ll sing, dance, catch bubbles and laugh yourself silly – plus you’ll get to see Mickey & Minnie, Sofia the First, Doc McStuffins and Timon in person! The DJ plays songs you know from favorite Disney Junior shows, while the host introduces each of the party’s stars. As you can see, Disney California Adventure Park has many great rides that you need to experience. Hopefully this ride list and height requirements resource will help you plan your next Disney vacation. Be sure you purchase a parkhopper ticket when visiting Disneyland Resort. Disneyland and Disney California Adventure Park are easy to hop between and with the MaxPASS there’s no reason not to visit some of your favorite rides in each park during your visit. This is an updated version of a post written by Tami Mittan. 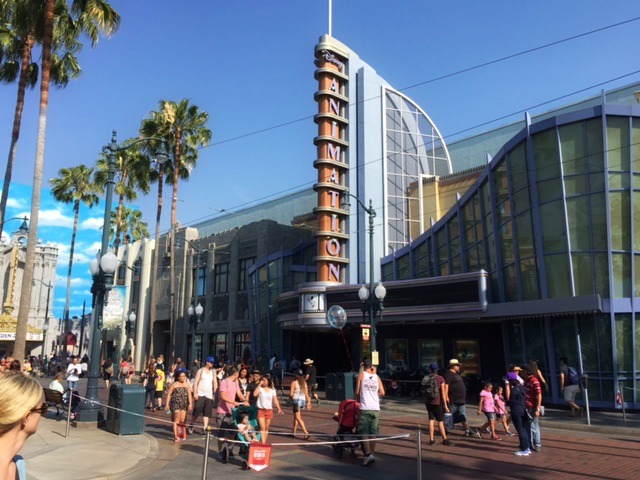 Disney California Adventure is the most lovable place in California… this post describes it very well. I really enjoyed reading it…Thanks for sharing! !